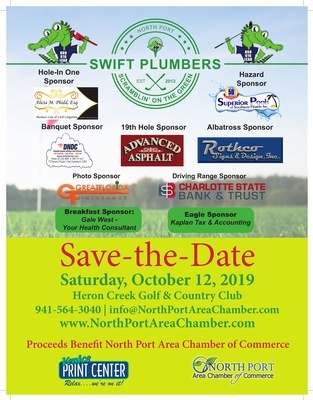 North Port Area Chamber of Commerce announces the Swift Plumber Annual "Scramblin' on the Green" Golf Tournament at Heron Creek Golf Club, Saturday, October 12, 2019. This is a 4-person Scramble - Shotgun Start. If you are interested in being a sponsor, please contact the Chamber office at 941-564- 3040.